New Website for Joseph J Entertainment! 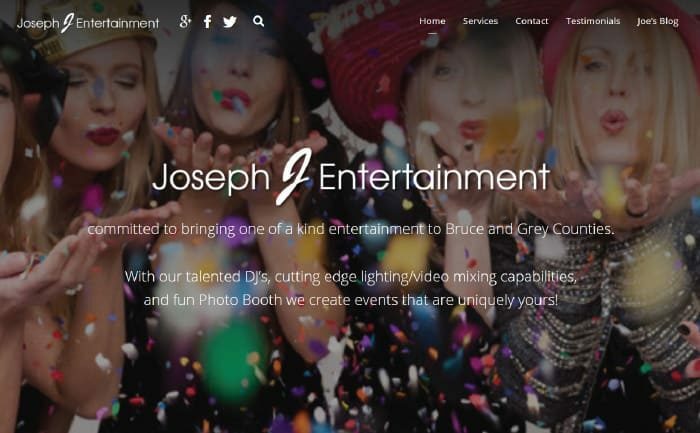 I recently spiced up the website for Joseph J Entertainment (a popular local entertainment business). Both responsive and retina ready the new site uses animation, full width page sections, sticky navigation, parallax scrolling, full width sliders, bright colours and social icons to advertise their services. Joseph J will be at the Rotary Huron Shore Run this Saturday (June 6, in Southampton) playing tunes and showcasing his new Photo Booth! Come down and check it out! « Joseph J Entertainment » Deadline for the August Paisley Advocate is July 25!